We will be hunting west of the Caroline Lodge about 2 hour drive. Our areas are primarily Wilderness, a Bighorn mecca as it is one of the hardest areas to access in the Southern Alberta Bighorn range, thus producing big Mature rams. 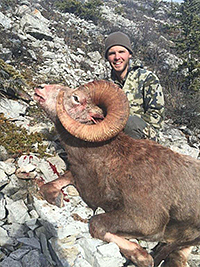 As well the Famous Banff National park always harbors large mature rams that frequent these areas making it in my mind Alberta’s top pick for harvesting a Large Alberta Ram with Gun or Bow. The area speaks for itself! But It is now owned and Managed by Chad SAVAGE Lenz and his guides in of Savage Encounters, world famous in the Sheep world for putting bow hunters and rifle hunters on sheep!! This area is in Savage’s own Back yard and he first hunted the area at the age of 18! That’s 27 years of sheep experience in and out of this new endeavor.